Phishing and online scams, in general, are not as common as they were back in the days. However, since its arrival to browser market, Microsoft’s pride, Edge, slowly gets the scammers attention. 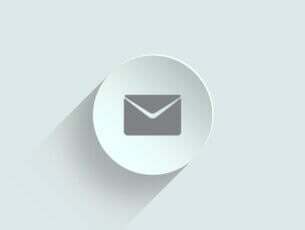 One of the most common malicious and fraudulent pop-ups is easily recognizable by the alleged virus alert. This is seemingly a common occurrence in Edge in recent times. This is, of course, a nifty way for an online scammer to make you panic and make mistakes. They’ll recommend reaching for help or sending your personal credentials. Never do that. Stay calm and continue below for a better insight on the topic. Whenever you see something like this in your browser:”Danger! Warning! Brace yourself! Your computer has a serious virus!”–rest assured — you don’t have anything to worry about. This is just a scamming trick, a treacherous attempt to scare an unexperienced Edge user. Back in the days, Google Chrome and Mozilla were frequently affected by these phishing pop-ups freezing the screen but added security measures almost completely eliminated them. On the other hand, Microsoft Edge is still susceptible to that kind of malicious pop-ups. 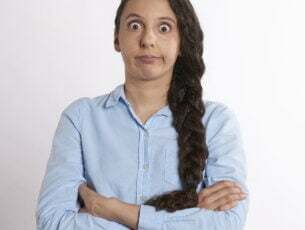 Now, if those scammers get a hold of a gullible user, they can indeed steal your personal data, Windows license, or mislead you to spend tons of money on phone calls. Don’t fall for it. If there’s indeed an imminent threat to your system, you’ll be notified timely by the antivirus or system itself (in case you rely on Windows Defender for protection). When something like this appears in Edge and sometimes it will, we recommend just pressing the Ctrl + Alt + Delete and killing the Microsoft Edge process. That’s the first step. Continue reading to find out how to remove it and how to protect in future. 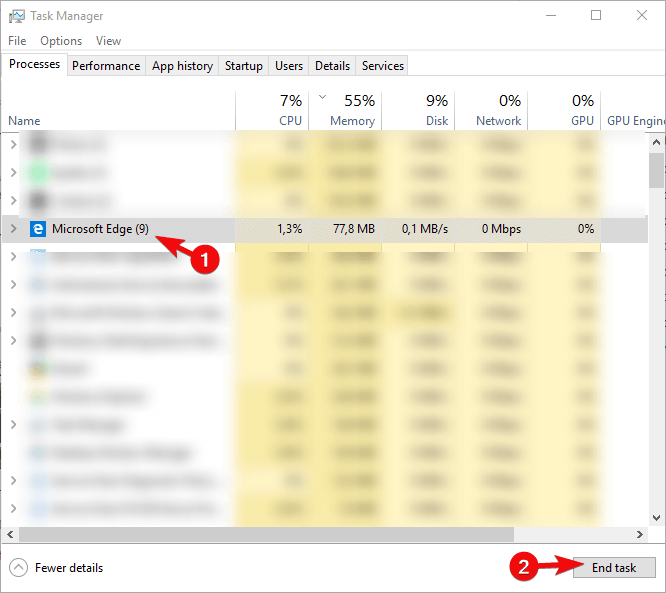 When the pop-up appears, open Task Manager and terminate Edge. 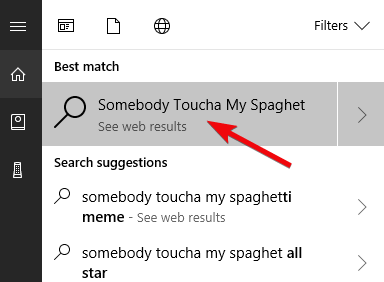 Instead of running the Microsoft Edge from a shortcut, type in any term in the Windows Search bar and search for it. Right-click on the newly-opened tab and chose to close all other tabs. Close Edge. The next time you start Microsoft Edge, the loophole won’t be effective and the pop-up should disappear. 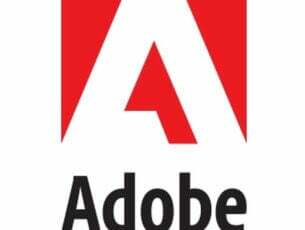 The next step is to scan for possible browser hijacker, and you can do it with any third-party antivirus at your disposal or with Windows Defender. On the other hand, the sole fact that the antimalware tool hasn’t acquired this as a threat means that you should look at alternatives. The tool like Malwarebytes AdwCleaner is great against PUPs (Potentially Unwanted Programs). It’s completely free, so make sure to download it here, and give it a try. 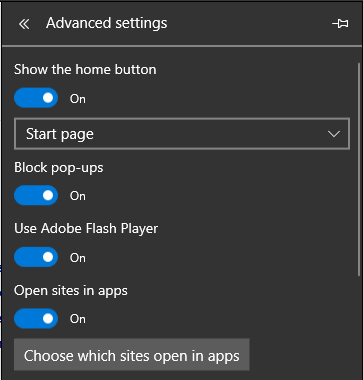 And, finally, just in case something hijacked your Edge browser and changed the preferred home page get it back in: Settings > Advanced settings > Start page. This is of utmost importance if you want to avoid the false warnings in the future. 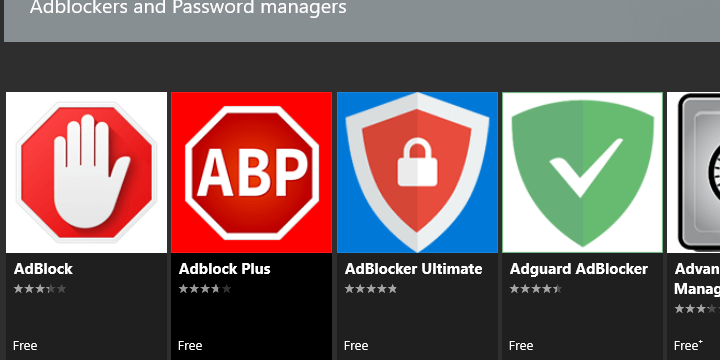 Now that the Edge browser supports extensions, make sure to get it an ad-blocking extension as soon as possible from the Microsoft Store. Besides that, make sure not to allow cookies on all sites and accept them only when prompted from a trusted source. Having a good antivirus for online protection is also a good way to protect from scammers and malware. Bitdefender 2018 is our weapon of choice, and we highly recommend giving it a try. You can learn more about Bitdefender here. That should do it. 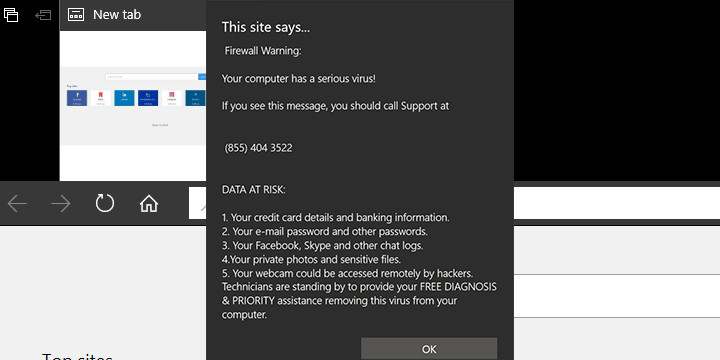 In case you still have issues with the Edge Warning virus alert, make sure to tell us in the comments section. We’ll be glad to help you address it.